Nasal polyps are small, benign growths of tissue that develop within the lining of the nasal passageways or sinuses. Patients with large nasal polyps can experience severe breathing difficulties, decreased sense of smell, headaches, nasal congestion or snoring. These side effects of nasal polyps can be resolved through surgical removal of the noncancerous growths, a procedure called endoscopic sinus surgery. Patients should discuss the complications of nasal polyp surgery with a doctor prior to having this procedure performed. During nasal polyp surgery, a surgeon can accidentally damage the bone that provides a barrier between the nose and the brain. Damage to this bone can result in cerebral spinal fluid leakage. Approximately one percent of patients who undergo this surgical procedure experience cerebral spinal fluid leakage complications, according to Dr. Alberto D. Fernandez with the Baylor College of Medicine. Cerebral spinal fluid leakage increases a patient's risk of developing a severe brain and spinal cord infection called meningitis. Meningitis can be life-threatening and may cause severe headache, fever or stiff neck symptoms. Typically, leakage of cerebral spinal fluid is detected and repaired during nasal polyp surgery and does not cause additional complications. If the leak is not detected until after surgery is completed, affected patients may require additional surgery to repair the damaged bone. Eye injury can occur as a complication of nasal polyp surgery, Johns Hopkins Medicine reports. Affected patients may experience loss of vision; double or blurred vision; or excessive eye tearing. Certain patients may also notice extensive swelling or bruising around the eyes. Such complications are rare and typically resolve as a patient begins to heal after nasal polyp surgery. Certain patients can develop scar tissue within the nasal passages as a complication of this surgical procedure, the University of California, San Diego, School of Medicine, warns. 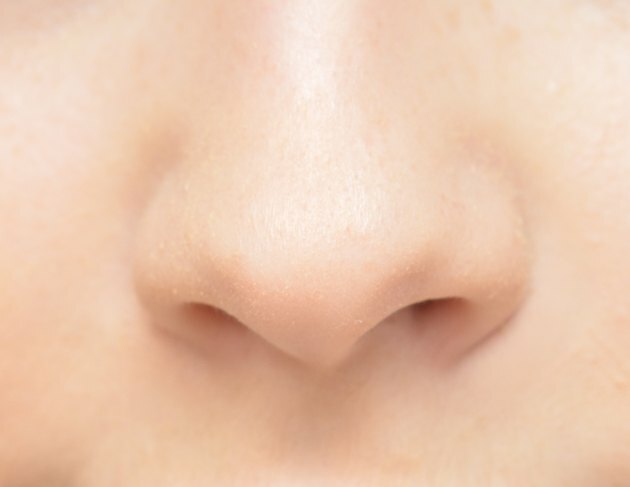 Nasal scarring is typically minor, but can cause changes in a patient's breathing patterns or sense of smell. Patients who continue to experience severe breathing difficulties through the nasal passages after surgery should consult a doctor. Nasal polyp surgery increases a patient's risk of developing bleeding or infection complications, Johns Hopkins Medicine explains. Mild bleeding or discharge from the nasal passages during or after surgery is normal and will subside as a patient continues to heal. Extensive bleeding during surgery may require a surgeon to immediately stop the nasal polyp surgery to limit blood loss. Rarely, patients may experience persistent or severe nasal bleeding after surgery. If this occurs, affected patients require prompt medical attention from a doctor. Patients who develop sinus infection symptoms after surgery, such as fever or nasal congestion, may require treatment with an antibiotic medication and should seek care from a physician.